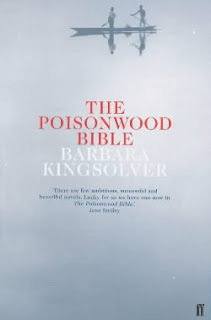 The Poisonwood Bible is one of those books that I have heard almost nothing but praise for. That tends to raise your expectations somewhat. Having finished it now, I will agree that it is superbly written, but I can't say that I loved it as much as the general consensus of readers. 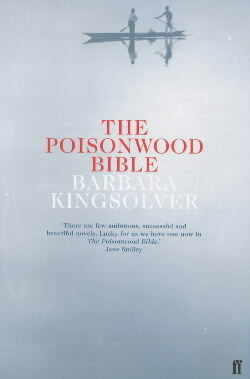 The basic premise of The Poisonwood Bible is that of the Price family moving to an isolated village in the Congo as missionaries. The book is narrated by the five women in the family as they watch the mission slowly but surely fall apart over time. As a premise, it works fine. To be honest, that wasn't what made me pick up the book in the first place, but it serves as a very good basis upon which the break-down of family and society can occur. So, I'll start with the positive. The narrators are all extremely well-written, to the point where I actually forgot that they were all imaginary; they comprise of Orleanna and her four daughters, Rachel, Leah, Adah and Ruth May, all of whom are written with recognisably different 'voices'. The only member of the Price family that we don't hear directly from is Nathan, the father of the family unit, which I think is probably a good thing considering how quickly he gets tiring as it is. I should elaborate on them individually right about now I suppose. Nathan Price is probably my second least favourite character out of the book, although I think that was intentional. He's your standard, bible-thumping religious zealot, unable to admit when he's wrong or when compromises should be made; a.k.a. he's the last person you really want to send into a completely alien culture. Orleanna was more sympathetic, if only because she has to put up with him constantly as well as look after four growing girls. She was pretty much neutral in my view for a lot of the novel, primarily for that reason though; while she's necessary to keep all these personalities in check, she doesn't really become interesting herself until about 400 pages in. Rachel is my least favourite character by far, simply because she embodies everything that I despise in myself and others: selfishness, overt materialism, stupidity, an unwillingness to pull her weight during desperate times, egotism, small-mindedness and a poor grasp of English. The last item might seem a bit petty in comparison to the others, but the way in which she butchers the English language made me want to punch her repeatedly. Leah, in comparison, is my second favourite character, probably because she reminds me of my sister a bit; she's the family tomboy, she's earnest, she's passionate, she lets her emotions blind her sometimes. She's a genuinely nice person, if flawed, and she brightened up the novel considerably. My favourite character though was Adah, Leah's twin sister; since she sustained brain damage in the womb, she's had to walk with a pronounced limb and rarely talks. Her silence masks a sarcastic, cynical streak as well as an intellectualism that I really wasn't expecting when I started reading; for me she kind of acts as an audience surrogate, as she seems to understand exactly why everything that her parents were expecting is falling apart. It was a refreshing change. Finally, there's Ruth May, who is about 5-7 years old during their stay in the Congo. She's a pleasant enough little girl, but, as I've said before, I'm not fond of child narrators, so her sections were pretty much neutral for me. Another positive aspect for me was the snippets about the native language there, which I found fascinating. Granted, I can see this being boring for those less interested in language, but I found it very interesting and I thought the way that it tied into the main storyline was very clever. So now for the negatives. I thought the tone was a bit uneven. This is the only criticism I've heard for this before I read this, and I found it to be a valid one. After the Price family goes their separate ways, it doesn't quite fit right with the previous plot-line. If the novel had ended at about the 400 page mark, I would have been satisfied with that as a story. After that, it follows the individual narrators as they deal with their experiences in different ways, and while that was interesting enough, it felt like a sequel novella that had been stapled onto the end of the first narrative. It also got a bit too preachy about the wrongs that Western civilisation has caused African society. Don't get me wrong, I think that the West, Britain and America in particular, do have a lot to answer for in regards to colonisation and the implementations of puppet dictatorships, but I don't think it needs to be explicitly hammered into a reader's head for 200 pages. Kingsolver makes good arguments, but they seem more suited to an academic paper than they do to a work of fiction.